All the proceeds from the sale of these 5 items will go to the 1/83rd Reunion fund. a. 1/83rd Unit Crest Patch (3.25"h x 2.75"w) - $6 each. Here is a photo. b. 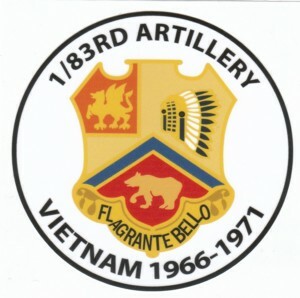 1/83rd Unit Crest Decal (Decal is round 3.5" x 3.5") - $5 each. Here is a photo. c. 1/83rd Hat (Adjustable-Black only) - $20 each. Here is a photo. 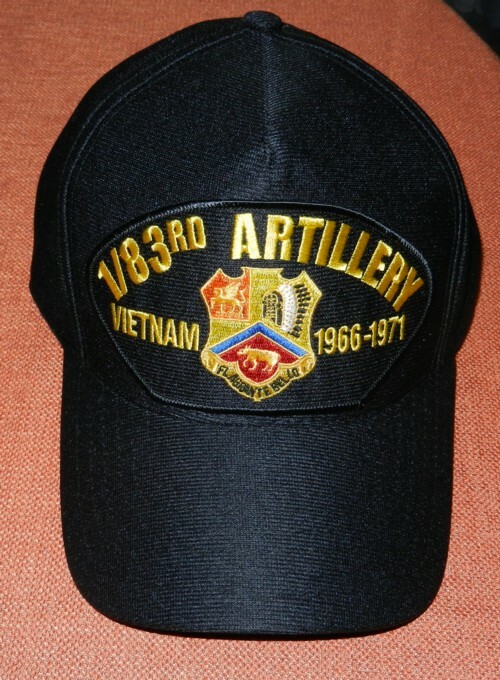 d. 1/83rd Unit Hat Patch (same patch as is on the 1/83rd hat, 3"h x 6"w) - $6 each. Here is a photo. 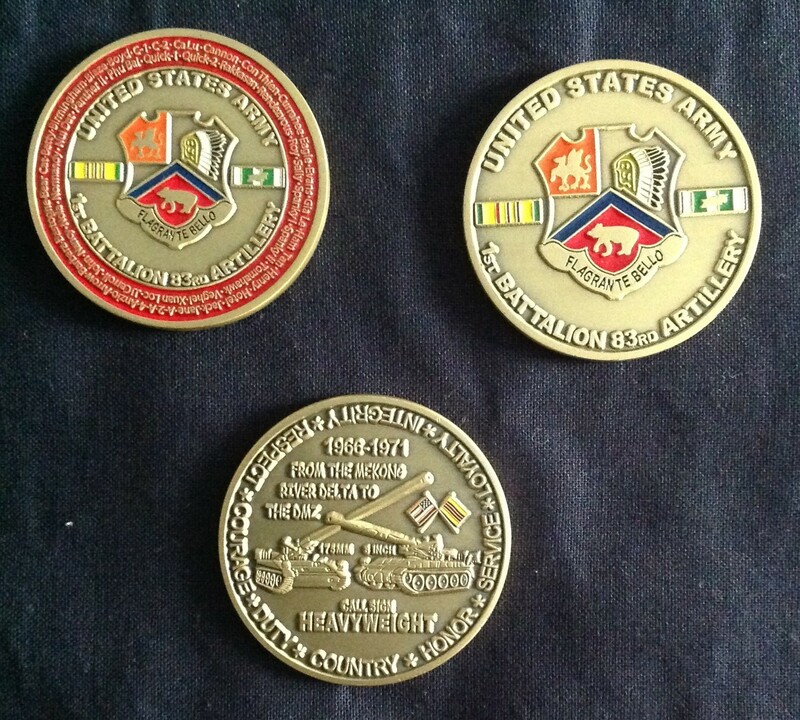 e. 1/83rd Challenge Coins (Available in 2 versions, one with firebase names and one without, please specify which version you want when ordering, 1.75" diameter) - $25 each. Here is a photo. Shipping and handling is included in the above prices. Check, Money Order or Cash only, no credit cards. To order the above items only, contact Bill Taggart at artillery_83rd@yahoo.com or 856-228-5614 (my contact info is also on the Roster). Make sure you supply your mailing address and phone number when making your request. Some have asked about the origin of the Challenge Coin. Here are a few things that I have found but more is also available if you go to Google and search for "history of the challenge coin". A challenge coin is a small coin or medallion (usually military), bearing an organization's insignia or emblem and carried by the organization's members. 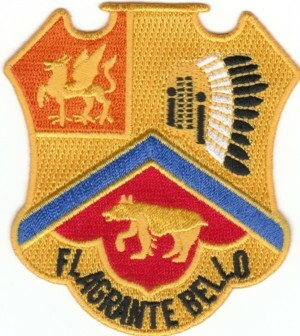 Traditionally, they are given to prove membership when challenged and to enhance morale. In addition, they are also collected by service members. If someone claimed to be part of a unit you could "Challenge" them to prove that they were and that the coin was shown as a means of proof. The items below have to be purchased directly from the Vendor, not through Bill Taggart. 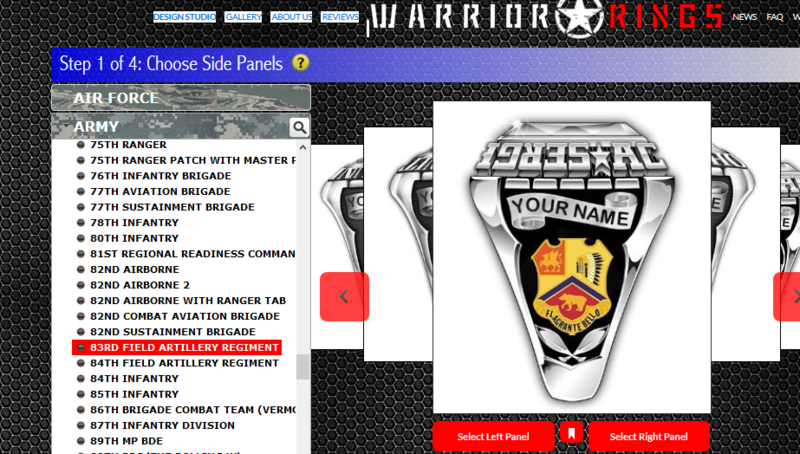 The sale of all of these items does not benefit the 1/83rd Artillery Reunion Fund. Click on the ARMY banner. 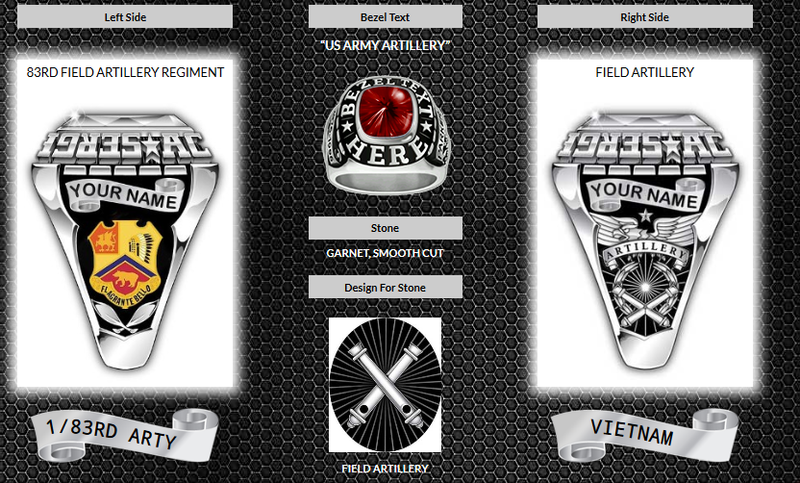 Then select "Battalions, Divisions, Regiments & Units" and scroll down to the 83rd Field Artillery Regiment. After that you have a 4-step procedure to build the ring the way you want it. Remember, this is an example, you can make several modifications. 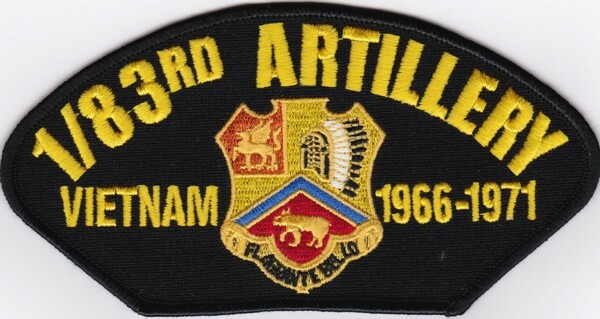 These (3) vendors all offer the same quality 83rd Artillery Unit Crest Pins. "I have bought from all 3 of these vendors and they are identical in quality, all are very good." 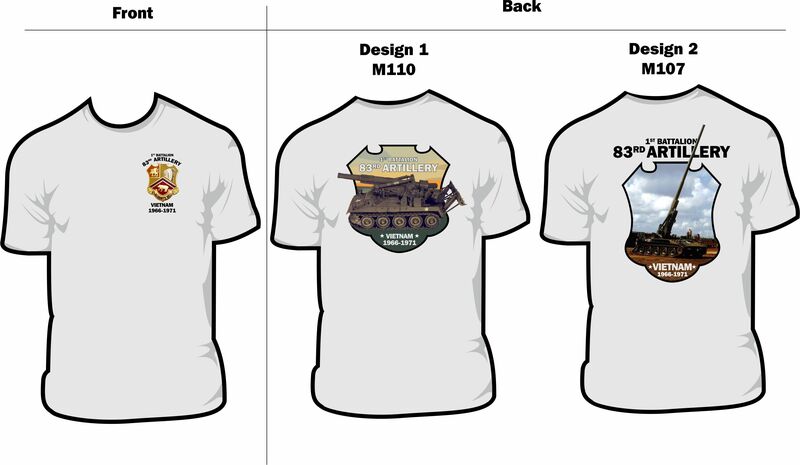 Big Frog Custom T-Shirts offers 1/83rd merchandise in 2 varieties, one showing an 8-inch and one showing a 175mm. Here is a sample and you can click here to see a larger photo. These are available in sizes Small-5XL. • Please state that you're ordering already finished artwork filed under the name Taggart.